Sweets for your sweetie. When I think of Valentine’s Day, the color red comes to mind. My favorite candies were always anything cherry flavored. I can remember growing up buying the assorted rolls of life savers and digging through to find the few lonely cherry sweets in the pack. We used to have this awesome penny candy store in our little town. You would grab a small brown paper bag and pick your candies from huge barrels. I think they were all a penny apiece. So many barrels of cherry candies to choose from! For a quarter you could leave with a bag of cherry flavored loot. I used to love sitting down as a kid to a big bowl of fresh cherries. I can hear my dad telling me if I swallowed the pits, a cherry tree would grow in my stomach. I knew better. 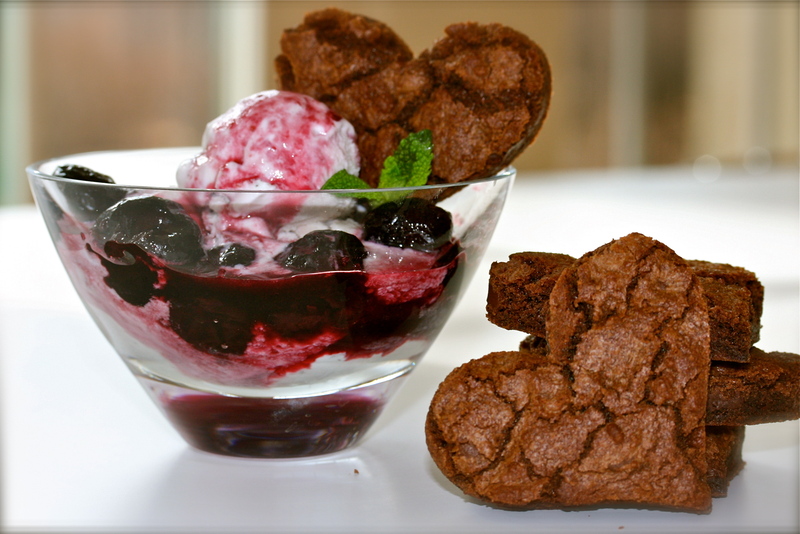 My love of cherries has brought me to make this decadent dessert. The base of the sundae is Cherry Vanilla ice cream. Buy your favorite brand, I used Breyer’s. This cherry sauce has an adult twist, due to the Grand Marnier. You can leave it out if you prefer. It adds a depth of flavor to the cherries and makes it that much more delicious. 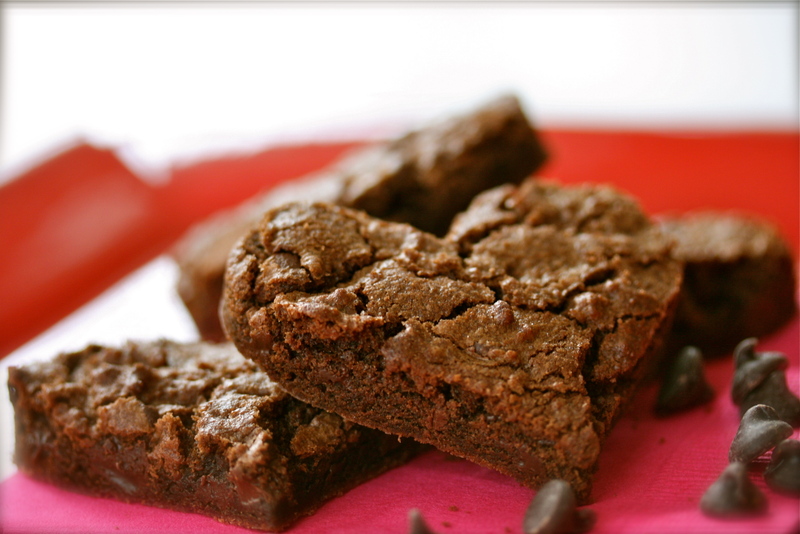 As far as these chocolately cookies go, they’re perfect to make anytime, anywhere, and especially for no reason at all. Place the thawed cherries, sugar, and lemon juice in a sauce pan and bring to a simmer on medium heat. Cook, stirring frequently, for about 8-10 minutes until the cherries release their juices and the sugar dissolves. Remove from the heat and stir in the Grand Marnier. Set aside and allow to cool. Place in the refrigerator, covered until cooled completely. 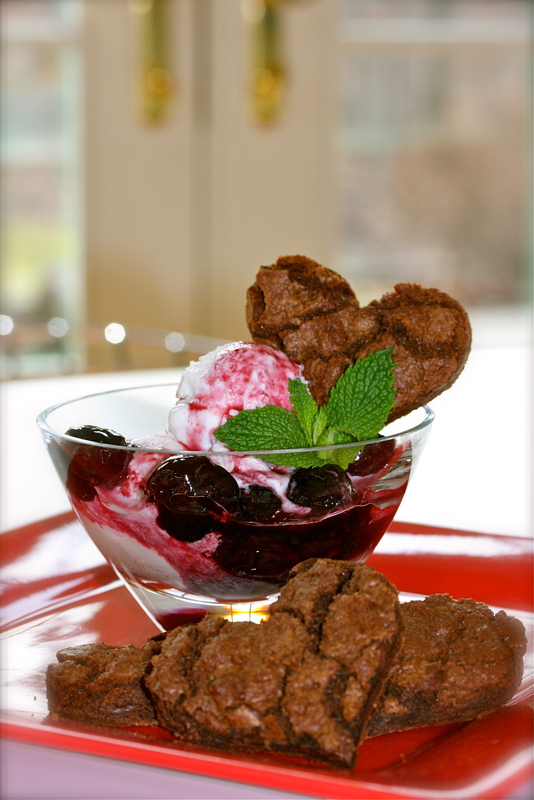 Serve over ice cream – yum! Preheat the oven to 350 degrees. In a large bowl, combine the flour, salt and baking soda and set aside. In a stand mixer, combine the butter, brown sugar and granulated sugar, mixing until fluffy and light in color. Add the vanilla, then add the eggs, one at a time, mixing after each addition. Mix in the cocoa. Add the dry ingredients in three parts. Stir in the chocolate chips. Line your cookie sheets with parchment paper. To make drop cookies I use an OXO cookie scoop, which I love. It makes perfectly uniform cookies. After you place all your scoops on the cookie sheets, dampen your fingers and gently press down the tops of each cookie. Bake for about 15 minutes – you want them to appear underdone. Allow them to cool a little, remove to a rack to completely cool. I bake on the convection setting in my oven and these were done in closer to 12 minutes. 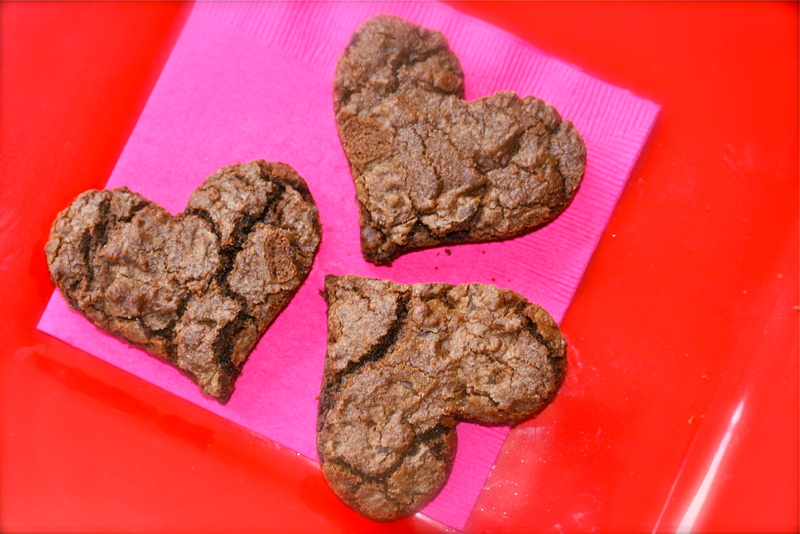 TO MAKE THE CHOCOLATE HEARTS… I baked one large cookie. After it cooled a little I used a small cookie cutter to cut out the hearts. Pretty cute, don’t you think? I should mention I made most of the batch as regular drop cookies and only a few hearts. Cutting out the cookies makes a lot of scraps – which are still delicious, but not so pretty. I forgot how delicious cherry vanilla ice cream was until I put this together. Really yummy! The cherry sauce is really yummy. Enjoy!